Environmental awareness and the desire for social, economic and environmental sustainability have led to more proactive management of farm nitrogen (N), phosphorus (P) and potassium (K) balances. Nutrient accumulation is when the amount of imported nutrients on farm exceeds the amount of nutrients exported from the farm. The implications of nutrient accumulation include degradation of water and air quality, which is reason for increased pressure on animal agriculture by the public, litigators and state and federal regulators. Similarly negative consequences can result from whole farm nutrient losses, when exported nutrients exceed the amount of nutrients imported on the farm. In these situations, the soil can be mined of nutrients, decreasing soil fertility and, when deficiencies start to occur, also crop yields. Thus, a clear understanding of the imbalances between farm nutrient exports and imports, and how they relate to farm management practices, is key to developing long-term, sustainable solutions for individual farms, and the animal industry in general. Fig. 1: Whole farm nutrient mass balance assessment. Sustainable solutions require improved nutrient use efficiency across the whole farm, balancing the nutrient flows of both the animals and the land. However, when it comes to whole farm nutrient management, it can feel like there are more questions for producers than time to evaluate and answer. Is cropland being fertilized at the proper times in sufficient quantities to supply nutrients to crops without accumulating nutrients? What nutrients need to be supplied in purchased fertilizer and feed this year to prevent nutrient loss? And once all those questions have been dealt with for the year, a new year comes around and the process begins anew. This is where a method of keeping track of nutrient management records from year to year in a systematic way can save time, money and conserve nutrients. 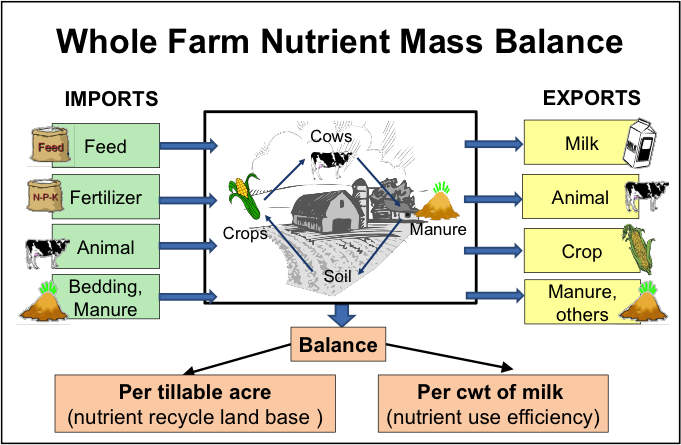 The idea behind the adaptive management concept is to maintain nutrient management records in such a way that one can assess the nutrient status of the whole farm (Fig. 1), pinpoint the areas where improvements can be made, and then track the progress of those improvements year to year. The whole farm nutrient mass balance (NMB) calculator is a tool that was developed to help in the assessment. The whole farm NMB calculator was first developed by Stuart Klausner at Cornell University, and modified and reprogrammed in Microsoft Visual Basic in more recent years. The software and supporting information (manual etc.) are downloadable from the whole farm nutrient mass balance project page of the Cornell Nutrient Management Spear Program (NMSP): http://nmsp.cals.cornell.edu/projects/massbalance.html. The NMB calculator is targeted for use by dairy farms, though it can be used to determine NMBs of any type of livestock operation. A data questionnaire was developed to help gather the data listed in Table 1. Within the NMB calculator, there are four basic pools where nutrients can be allocated on a farm: (1) they are imported to the farm in the form of purchased products; (2) they are exported from the farm as products sold/exported; (3) they remain on the farm to be recycled; or (4) they are lost to the environment. The NMB program calculates N, P, and K imported onto and exported from the farm in the form of feed, fertilizer, animals, crops, milk, manure and bedding. The difference between nutrients imported and nutrients exported is expressed as N, P and K balance per acre of cropland, and per unit (cwt or hundred weight) of milk produced (Fig. 1). Negative values are not sustainable over time, as they indicate that more nutrients are being taken off the farm than are replaced. However, large positive balances are not desirable either, as they indicate nutrient inefficiencies and increased risk for environmental losses. To demonstrate how the NMB calculator assists producers in evaluating best management practices, data from a central New York dairy farm were analyzed over the course of 8 consecutive years (2003-2010). In the initial assessments, NMB values were high, and 76, 69 and 64% of the imported N, P, and K remained on the farm (Fig. 2). However, by gradually matching feed and fertilizer purchases with animal and crop needs, the farm reduced its nutrient imbalances, and only 45, 34 and 31% of the imported N, P, and K remained on the farm in recent years. Moreover, the improvements made resulted in a milk production per cow increase from a little less than 23,000 to more than 24,000 lbs of milk over the same time period. Fig. 2. Nitrogen, phosphorus and potassium mass balances (lbs/acre) measured by a New York case study dairy farm over 8 years. Whole farm adaptive management approaches to nutrient management have been recognized by the Natural Resources Conservation Service (NRCS) in its new national NRCS590 standard and many states are currently discussing approaches for implementation. The NMB calculator generates an overall summary of N, P and K balance of a particular farm using recorded imports and exports; these annual summaries can assist producers in making management changes that lead to more efficient production and resource conservation. Soberon, M.A., Q.M. Ketterings, C.N. Rasmussen, and K.J. Czymmek. 2013. Whole Farm Nutrient Balance Calculator for New York Dairy Farms. Nat. Sci. Educ. 42:57–67. 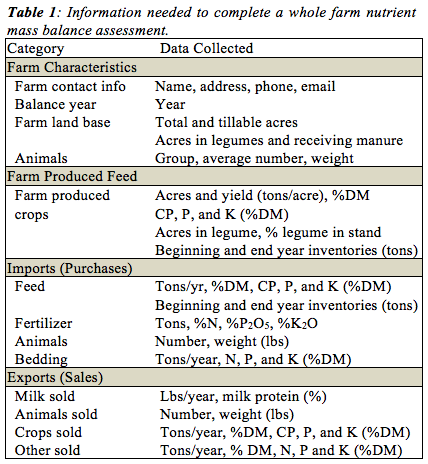 A whole-farm nutrient mass balance (NMB) is the difference between the amounts of N, P, and K imported onto dairy farms as feed, fertilizer, animals, and bedding, and exported via milk, animals, crops, and manure. We can express a NMB per tillable acre to indicate the potential for recycling nutrients in the land base, an environmental indicator, or per hundred weight (cwt) of milk, a milk production efficiency indicator. Large positive NMBs per acre suggest high risk of nutrient losses to the environment, while large positive NMBs per cwt reflect low nutrient use efficiencies, and potential economic loss for the farm as well. Negative NMBs (resulting from exports exceeding imports) reflect mining of soil P and K resources, and will eventually reduce crop yields. Annual NMB assessments give farmers a chance to compare the farm against peers in the same milk production group, and to evaluate the impact of management changes on nutrient use efficiency and production. Fig. 1: Distribution of N, P, and K mass balances (lbs/acre) for concentrated animal feeding operations (CAFOs) and animal feeding operations (AFOs) based on 102 NY dairy farms. In 2006, NMBs for 102 dairy farms from 26 different New York counties showed a range from -35 to 211 lbs N/acre, from -7 to 45 lbs P/acre, and from -45 to 132 lbs K/acre (Fig. 1). Also the NMBs per cwt of milk varied widely among New York dairies: from -1.3 to 2.6 lbs N/cwt, from -0.11 to 0.47 lbs P/cwt, and from -0.73 to 1.69 lbs K/cwt. Ranges in NMB were similar when comparing CAFOs and AFOs. How do nutrient mass balances relate to milk production per cow? Dairy farms in our database averaged 19,600 lbs milk/cow per year, slightly higher than the average milk production of New York dairies in 2006 (18,900 lbs/cow per year). Dairy production does not depend on large positive balances (Fig. 2); we found high producing dairies (>20,000 lbs milk/cow per year) with negative NMBs per acre as well as high producing dairies with large positive NMBs per acre. Fig. 2: Relationships between milk production per cow and nutrient mass balances per acre show that highly productive farms can operate within the feasible balances. 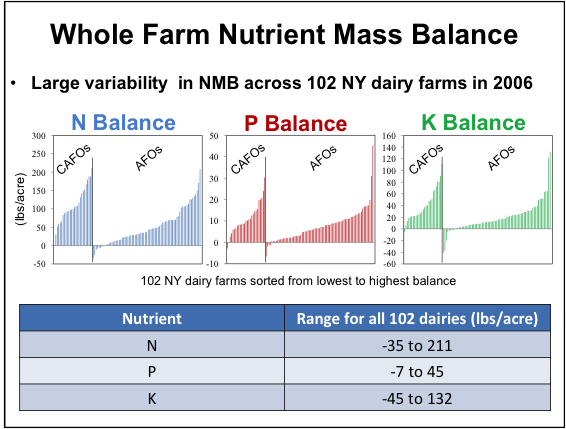 What’s a “feasible” nutrient mass balance? The data showed large ranges in NMBs among the 102 farms, but this does not tell us what is reasonably achievable, or “feasible”. A feasible NMB should allow dairy farms to be economically profitable, environmentally sustainable, and flexible enough to allow for the many variations among farms. Based on the largest dairy farm database we had for one individual year (2006), we defined “feasible” NMBs per acre as those at or below which 75% of the dairy farms in our database were operating: ≤105 lbs N/acre, ≤12 lbs P/acre, and ≤37 lbs K/acre (Table 1). We also defined a “feasible” NMB per cwt of milk produced as those at or below which 50% of the dairies were operating in 2006: ≤0.88 lbs N/cwt, ≤0.11 lbs P/cwt, and ≤0.30 lbs K/cwt (Table 1). Fig. 3: Feasible balances (optimal operational zone) based on 102 dairy farms in New York. 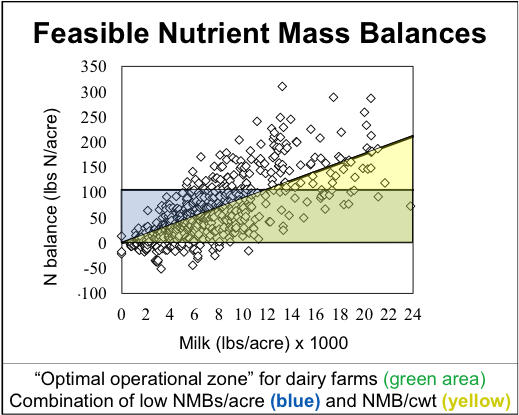 Combining both indicators, the most efficient farms have balances in the green area in Fig. 3. Although the current assessment of feasible balances for New York can change over time as more farms join the study, evaluations so far have shown that farms that operate outside of the green area (Fig. 3) might have opportunities for improvements in nutrient use. Farms with high animal densities (more cows per acre) tend to have higher NMBs per acre than low density farms, and therefore higher risk of nutrient losses to the environment. However, NMBs per cwt are unrelated to animal density, except at very low density farms (Fig. 4). This suggests that high density farms need to operate with high nutrient use efficiencies to reduce the risk of nutrient losses. Farms that grow a high proportion of the feed in the farm itself tend to have lower NMBs per acre and similar NMBs per cwt than farms that purchase much of the feed (Fig. 4). Fig. 4: Relationship between the N mass balances per acre and per cwt (without manure export) and animal density and farm produced feed. Experiences with a large number of farms over the past ten years has shown that opportunities exist for some dairy farms to improve NMBs by producing more feed on the farm, implementing precision feeding, adjusting fertilizer use, exporting crops (in farms with low animal densities) and exporting manure (in farms with high animal densities). Farms with less than 1 animal unit per acre (about 2 acres per cow plus her replacement) were typically able to stay below the feasible balances, whereas on higher density farms, export of manure and/or crops was needed to lower balances. Cela, S., Q. Ketterings, K. Czymmek, M. Soberon, and C. Rasmussen. 2014. Characterization of nitrogen, phosphorus, and potassium mass balances of dairy farms in New York State. Journal of Dairy Science 97:1-19. Soberon, M.A., Q.M. Ketterings, C.N. Rasmussen, and K.J. Czymmek. 2013. Whole Farm Nutrient Balance Calculator for New York Dairy Farms. Natural Sciences Education 42:57–67. Thanks to all the farmers, consultants, SWCD and NRCS staff, and Cornell Cooperative Extension educators that participated in this study. Thanks also to Françoise Vermeylen from the Cornell University Statistical Consulting Unit for statistical advice. This work was supported by grants from the Northern New York Agricultural Development Program (NNYADP), Northeast Sustainable Agriculture Research and Extension (NESARE), Federal-Formula Funds, and a USDA-NRCS Conservation Innovation Grant. For questions about these results contact Quirine M. Ketterings at 607-255-3061 or qmk2@cornell.edu, and/or visit the Cornell Nutrient Management Spear Program website at: http://nmsp.cals.cornell.edu/.